In addition to LANGYARNS and Amano, Berroco is now the US distributor for James C. Brett yarns. 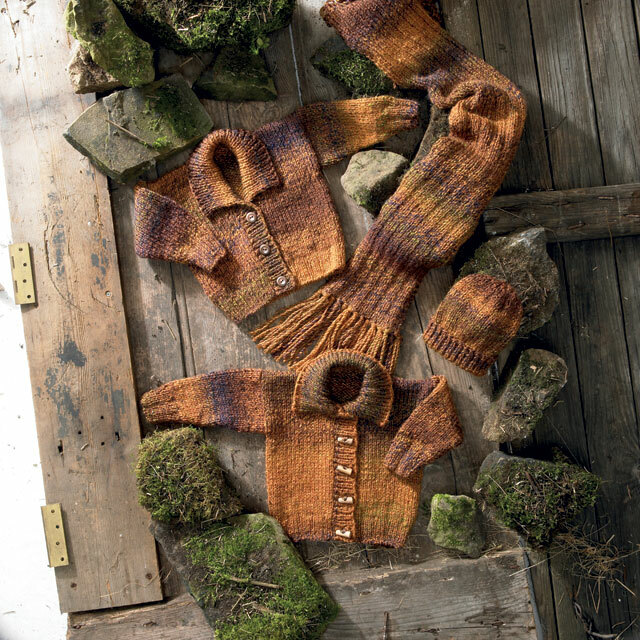 James C. Brett is based in the United Kingdom, and has a great history—read more about them in this week’s KnitBits. Today I’m taking a closer look at one of their outstanding yarns, the super popular Marble Chunky. Marble Chunky is a 100% acrylic yarn that comes in more than 40 shades. Each ball of yarn has a whopping 341 yards on it, and knit at a chunky gauge on US size 10 (6 mm) needles, can work up quickly in a variety of projects! The Weekend Jacket, shown above, demonstrates how great the yarn can look when knit into garments. For my swatch, I used the recommended needle gauge, and my tension came out just a hair off from the recommended gauge. I got 14.5 stitches and 23 rows to 4″, and the ball band suggests a gauge of 14 sts and 20 rows to 4″. Since this is a 100% acrylic yarn, giving it a soak (as I would with any yarn that was all natural fibers or a blend of natural and synethetic fibers) wouldn’t really do too much to change the nature of the swatch. To try to get it to lay a little more flat, I did hit it with a bit of steam—just enough to try to get the yarn to relax a bit. I chose a jewel-tone variegated shade of Marble Chunky for my swatch, but the yarn comes in wildly variegated shades and also more tonal hues. This wide range of colors means you have a vast selection of shades to choose from when picking yarn for a pattern. James C. Brett has many patterns available for Marble Chunky (scroll down to the bottom of the page for the patterns). Currently, the James C. Brett patterns are still only available as high-quality, hard-copy pattern leaflets printed on substantial paper, so if you see a particular pattern you want, be sure to contact your LYS and let them know!